The suburb of Alexandria, where our club was founded by Phillip Tovey in 2011, is situated 3km to the south of the Sydney CBD and was originally part of the suburb of Waterloo until their split in 1868. Waterloo was named after the Battle of Waterloo and many of the streets, parks and buildings in the area still hold the names from that battle. The British Commander at Waterloo was The 1st Duke of Wellington, Arthur Wellesley. The strength of his reputation earned him the nickname “The Iron Duke”, and it is this name that we have taken for our team as it is also the namesake of our original club rooms at The Iron Duke Hotel on Botany Rd. The club’s coat of arms is a variation of the Duke of Wellington’s coat of arms, which has the red stripes (when on a coat of arms this means Warrior, Martyr and Military Strength), the gold (meaning Generosity) and the Lions (The symbol representing a Great Warrior). The motto “Para Bellum” is Latin, which translates as “Prepare for War”. This also references the Iron Duke’s long service in the armed forces. The Iron Duke was the master of both defence and attack, traits which can be directly transferred to success on the rugby pitch. Rugby is its own 80 minute war. Our aim at Alexandria Dukes RFC is to create an environment where rugby can be played and enjoyed by players and spectators of all ages. We aim to be recognised as a leading club in NSW Suburban Rugby Union as we strive for excellence not only on the pitch but also through our coaching, volunteering, social events and community involvement. 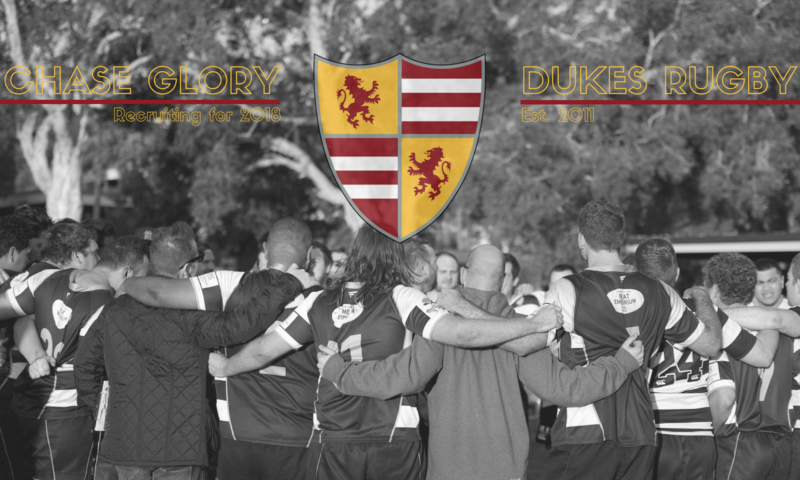 We want to provide facilities and coaching of the highest standard to ensure that those playing and watching are proud to be a part of Alexandria Dukes RFC. At Alexandria Dukes RFC we want to nurture our players and ensure excellent retention levels by developing a club that has good facilities, outstanding coaching and a fun social environment. The era of professional rugby is here to stay and whilst we must embrace the modern way, through a professional and business-like administration it is essential that we remain focused on being a “real” rugby club for our players, former players, all Alexandria Dukes RFC members, families and spectators. The Dukes are a club where anyone is welcome, regardless of age, race, nationality, ability, profession, sexuality or otherwise. The Dukes fully support the ARU’s Inclusion Policy launched in 2014, designed to stamp out all forms of discrimination and homophobia in Australian rugby.